Eastern and western redbud, known botanically a Cercis canadensis and orbiculata, respectively, are large flowering shrubs or small trees. They are commonly planted for the profusion of pink to purple red buds and flowers that appear in spring. As a member of the pea family, redbud also produces seedpods that mature in the late summer and fall. 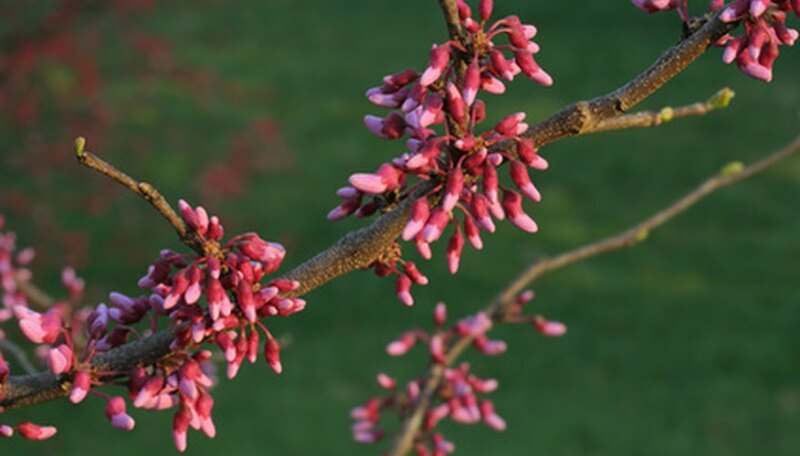 Redbud will flower even on old wood, hence it does not require pruning for bloom performance. It can, however, tolerate thinning for health, if needed, and pruning for size to suit the surrounding landscape design. Prune your redbud in the late spring, if needed, after flowering has finished for the year. Pruning later in the year risks diminishing the bud set for the following spring's bloom. Cut away abrading, broken, cracked, diseased or otherwise unsightly branches. Place the cut on the bias down to a point of healthy woody tissue just 1/4 inch above a leaf node or bud, or down to where the problem branch emerges from the parent branch. Thin the interior of the redbud to increase sunlight penetration and airflow and to rejuvenate non-performing older branches. Cut back up to one-third of the interior branches down to the parent branch and pull them from the canopy. Distribute the cuts evenly so that the branch structure is weighted relatively evenly in the canopy. Shape the perimeter of the redbud canopy, if required, by trimming the tips of the branches back to the desired length. Cut branch by branch and place all of the cuts on the bias 1/4 inch above a leaf axil or bud to encourage new growth and branching. Use secateurs and loppers to sever small diameter branches of less than 1/2 inch, but use a fine toothed pruning saw to cleanly remove branches with a diameter any larger than 1/2 inch.